Your pitch is the first thing people hear when they ask about your business. Does yours create interested fans who give you money on the spot or do you receive disinterested yawns? If you want to jazz up your pitch (which can then transform your tagline, your WHY, and your brand) and really spark interest from the people you meet, you’ll want to check out Dyana Valentine’s Pitch Perfect Pack. I had a tagline and brand that I loved but I constantly stumbled over how to answer that tricky question, “So what do you do?” Dyana’s audio lessons helped me see the importance of this short response. It’s what can seal a deal and create new partnerships. Rock your pitch and you can have clients lining up to work with you and use your product. She also showed me how I wasn’t putting enough of my customer and her needs in my pitch. What makes Dyana’s audio pack unique? It’s one thing to fill out a great worksheet but it’s 10x better to listen to Dyana explain her pitch process in her own exuberant voice. It really helped me rewrite several versions of my pitch, from the elevator speech to my introduction (should I attend a conference and want to impress people). You can use it over and over! Dyana crafted this pack so that you can ‘rinse and repeat’ the audio and worksheet to craft copy for a service, a product, or yourself! The best part is that her process helps you write all of these things in your own words, which makes it stronger. Plus, sparking up your pitch to resonate with your own voice will help you brush up on your purpose. 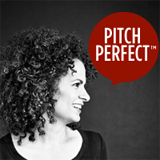 Dyana Valentine shines in this new audio lesson, Pitch Perfect Pack. There’s a reason why she’s called a ‘whip-cracking instigator’ and this time she’s ready to help you polish your pitch. With a killer answer to ‘What do you do for a living?’ you can excite future fans and seal deals with potential clients left and right! I have never been so excited to meet new people (and old family members) to tell them what I do now.